Secretary of State Hillary Clinton seeks a "level playing field" when it comes to China trade. (CNN) -- U.S. Secretary of State Hillary Clinton pressed for greater commercial access for American businesses in China on Sunday, urging Beijing for a "level playing field." 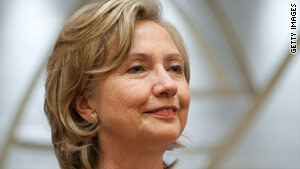 Clinton spoke to American and Chinese business executives in Shanghai, where she had finished touring the World Expo. She was headed to Beijing for two days of talks that will touch on a wide range of issues of shared interest to the United States and China. "For trade to work in any economy, for it to produce the benefits we know it can, there must be a level playing field where domestic and international companies can compete freely and openly," Clinton said. "For example, transparency in rule making and standard setting, nondiscrimination, fair access to sales to private sector and government purchasers alike -- and the strong enforcement of intellectual property rights -- are all vitally important in the 21st-century global economy." She added: "American companies want to compete in China. They want to sell goods made by American workers to Chinese consumers with rising incomes and increasing demand. This is a win-win for our two countries." On Saturday, Clinton toured Expo 2010 Shanghai that, much like the 2008 Summer Olympics, is viewed as part of China's coming-out party as a global player. China has pumped up to $58 billion into the local economy preparing for the fair. It expects 70 million visitors during the fair's run from May 1 to October 31. A total of 189 countries were participating, Expo organizers said. "The Expo represents an extraordinary opportunity to strengthen the cultural and commercial ties between the U.S. and China," Clinton said. "And from what I saw yesterday, it's clear that our pavilion is already delivering results for the American people, American companies and the U.S.-China relationship." Clinton is leading a delegation of more than 200 officials from the Obama administration to China for the Strategic and Economic Dialogue. The talks begin Monday. Practically every agency of the U.S. government is represented, including administration heavyweights such as Treasury Secretary Timothy Geithner, Health and Human Services Secretary Kathleen Sebelius, U.S. Trade Representative Ron Kirk, USAID Administrator Rajiv Shah, Federal Reserve Chairman Ben Bernanke and Christina Romer, chairwoman of the president's Council of Economic Advisers. Key players from the Pentagon and U.S. Pacific Command will also be there. "In the coming days, officials at the highest levels of our administration will discuss issues of economic balance and competition with our Chinese counterparts at the Strategic and Economic Dialogue in Beijing," Clinton said. "President Obama has made this a priority and it is part of our broader efforts to build a more balanced global economy that will be less susceptible to crisis and contagion and will lead to prosperity that reaches further and deeper." The meeting is a follow-up to the first Strategic and Economic Dialogue established by President Obama and Chinese President Hu Jintao in April 2009 in Washington, where the Chinese delegation was just as large. But this year, the U.S. faces a stronger China, whose political and economic stature has grown in the wake of the global economic crisis. There is no shortage of issues for Clinton to talk about on the "strategic" front with her Chinese hosts, whose delegation is led by Vice Premier Wang Qishan and State Counselor Dai Bingguo. The U.S. hopes that China will support a U.N. Security Council resolution imposing tough sanctions against Iran and work harder to rein in North Korea after a South Korean investigation found that a North Korean torpedo sank one of its warships. The U.S. is also concerned about China's censorship of the Internet. The situation in Afghanistan will also be high on the agenda, as China is a major donor there. The "economic" part of the dialogue, however, is even thornier. With the economic crisis in Greece spreading to other countries in Europe and sinking the euro, China is likely to argue that now is not the time.